Most DiDi necklaces are Princess length as I find this the most versatile, going with practically any outfit. It is also the most flattering for women with shorter necks and with bigger busts. Those of us blessed with a fuller figure should avoid matinee length necklaces as they tend to end where the cleavage begins and either sit strangely when worn over jumper or t-shirt or invite people to peer more closely at one's bosom, especially if there is a pendant nestling there! Longer lengths that skim over the top of the bust are OK. If your figure is more of model proportions then matinee length is fine and longer lengths stunning - especially over a plain shift dress or roll-neck jumper. Collar and choker necklaces are lovely with evening wear and big-bead chokers can actually enhance a shorter neck. It depends on how confident you are about your neck and chin area and jewellery can enhance or detract, depending on what works best for you. Lariat – 48" + Very long open-ended necklace: one end can be looped through the other end or it can be wrapped round your neck several times, or even wound round your wrist for a chunky bracelet. 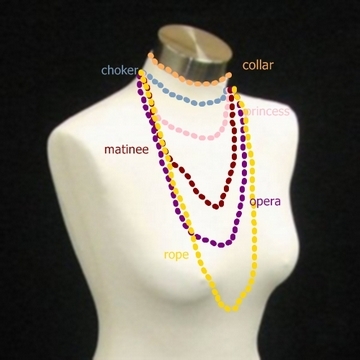 These necklace lengths are based on necks with a 12"-13" collar size. If your neck is thinner or wider than this (and let's face it, many, many women have wider necks than this!) then simply measure your collar size and add that number of inches to the lengths above. And don't forget, if you would like me to lengthen any necklaces on the website to make them the right length for you I can generally do this for you. The average size for women's bracelets in the UK is 7"-7.5", and this is the size I generally make bracelets. But everyone is different, so if you see a bracelet you like and need it smaller or larger, just contact me and I'll be happy to customise just for you.